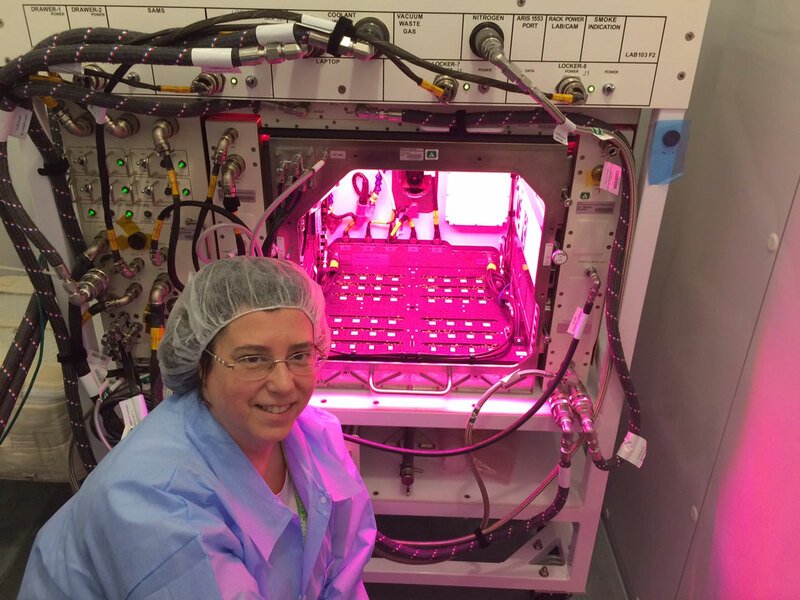 PNNL scientist Mary Lipton at Kennedy Space Center, in front of a duplicate of the habitat that will grow Arabidopsis plants on the International Space Station. RICHLAND, Wash. — In the wee hours this Monday, May 21, a rocket will thunder off from a NASA launch pad in Virginia, carrying a handful of seeds, part of a science experiment in which a scientist at the Department of Energy's Pacific Northwest National Laboratory is playing a key role. The destination is the International Space Station, soaring at more than 17,000 miles per hour as it orbits Earth 254 miles above our heads. The precious payload is part of an experiment led by scientist Norman Lewis of Washington State University to understand how plants grow in space, a crucial issue affecting the availability of food and oxygen on future long-duration missions. The seeds include unique types of the plant Arabidopsis developed by Lewis that are deficient in lignin — the fibrous substance that allows plants to grow upright. Scientists will study how the plants respond to the weightless conditions of the space station. For instance, will the plants still grow "up" even in a microgravity environment? Scientists will plant the seeds next month and then use more than 180 sensors to take detailed measurements for several weeks before the plants are harvested and hitch a ride back to Earth on a subsequent mission. Then a team led by Mary Lipton at EMSL, the Environmental Molecular Sciences Laboratory, a DOE Office of Science user facility, will analyze thousands of the plants' proteins at EMSL to understand how the plants grow in space compared to counterparts being grown in identical conditions — except for the force of gravity — back at Kennedy Space Center in Cape Canaveral, Fla.
Live viewing of the launch, tentatively scheduled for 1:39 a.m. Pacific Time Monday, will be available on NASA TV. Check that link for updated launch information. More information is available in the WSU news release. EMSL, the Environmental Molecular Sciences Laboratory, is a DOE Office of Science user facility. Located at Pacific Northwest National Laboratory in Richland, Wash., EMSL offers an open, collaborative environment for scientific discovery to researchers around the world. Its integrated computational and experimental resources enable researchers to realize important scientific insights and create new technologies. Follow EMSL on Facebook, LinkedIn and Twitter.